The Egyptian motif of the scarab, a symbol of self-renewal, experienced great popularity in the late nineteenth and early twentieth centuries. Thousands of glass scarabs were produced by at Tiffany’s Corona factory and inset into jewelry, metalwork, and ceramic vases, as seen here. Tiffany’s Favrile pottery is known for its unique color effects, created by mixing chemicals directly into the clays rather than surface painting. 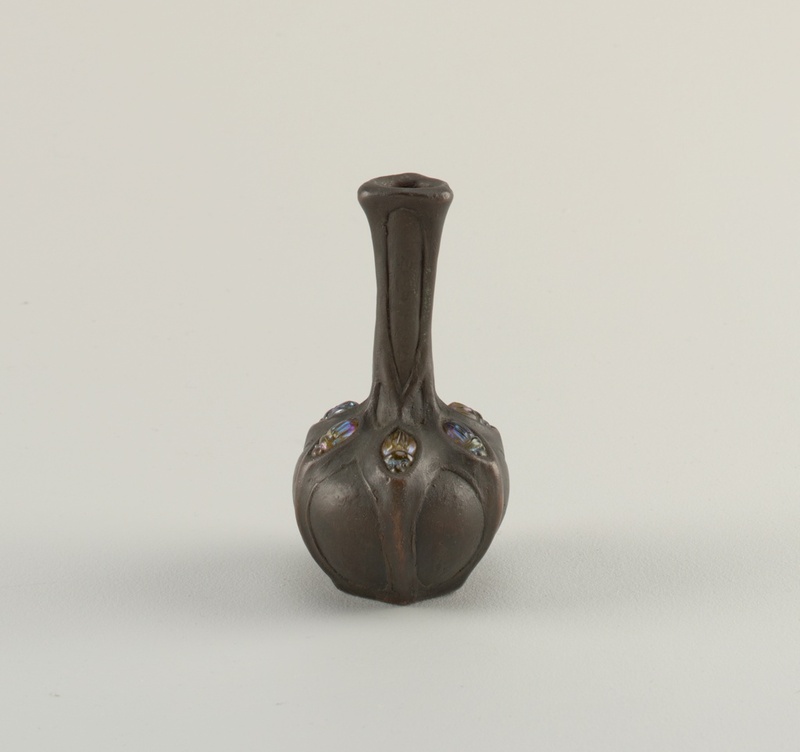 This vase also features Tiffany’s bronze electroplating technique, introduced on clay objects in 1908, which gave the exterior a metallic quality. Tiffany has combined this modern innovation with an ancient Egyptian motif: scarabs. Ancient Egyptians believed the scarab, or dung beetle, represented the sun god Khepri. They placed scarabs of semi-precious stone and faience on mummies for good luck and as symbols of resurrection. Here, the use of the glass scarabs satisfied the American fascination for all things Egyptian, which began with the first archaeological expeditions to Egypt in the 1860s. Tiffany’s production of new objects that reflected the look of ancient work was also spurred on by a number of archaeological digs being carried out in the late nineteenth and early twentieth centuries. An ardent admirer and collector of French artistic ceramics of his day, Tiffany felt his experiments never exceeded the skills of the French, unlike his work in glass. Tiffany’s pottery efforts never garnered the enormous success of his stained glass and other ventures, and by 1920, he had given up ceramics altogether. This vase along with an array of other forms in glass and metal designed by Louis Comfort Tiffany are currently on view in Passion for the Exotic: Louis Comfort Tiffany and Lockwood de Forest.